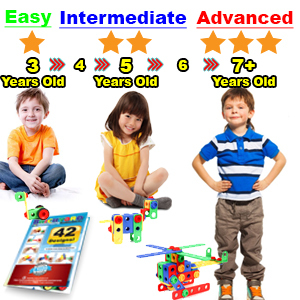 The first 5 years are crucial when it comes to a child’s cognitive development and no other educational toy can help your kids develop their Science, Technology, Engineering, and Math skills better than the Brickyard STEM Construction Engineering Building Blocks. Brickyard STEM Construction Engineering Building Blocks is a 101-piece STEM toy designed to engage your children's imagination for hours. Unleash your kids' creativity and encourage them to build anything they put their minds to. 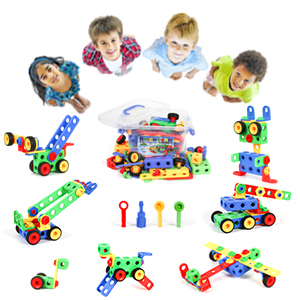 We give you enough tools for 4 kids to build at the same time! From dinosaurs to race cars to helicopters...the possibilities are endless! Set up your kid to be the next Einstein, Newton or Da Vinci! 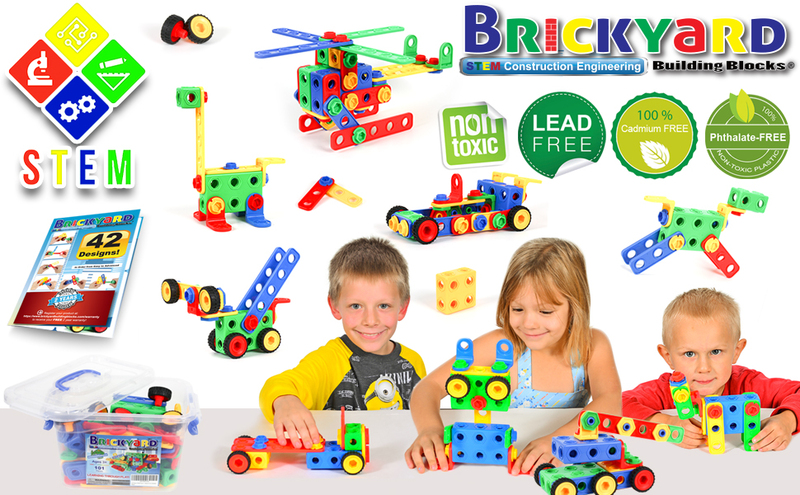 Brickyard STEM Construction Engineering Building Blocks is designed to improve your children's Science, Technology, Engineering, and Math skills. Enhance your kids' creativity and imagination by challenging them to build their own animals, cars, robots and anything they can imagine! 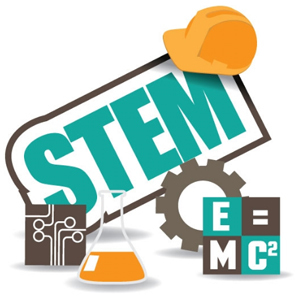 We are committed to supporting the growth of STEM education through our building blocks that build opportunities for high-quality learning. 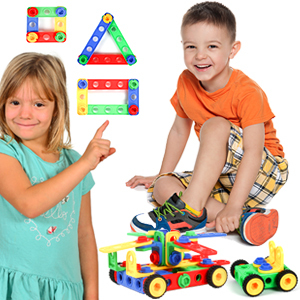 Brickyard Construction Engineering Building Blocks include a large, full-color guide with 42 designs your kids can build, starting from easy for 3 year olds to intermediate for 4-5 year olds to advanced for ages 6 and over. Give your children a gift that will last, that will be cherished, that will be played with countless times. Brickyard STEM Construction Engineering Building Kits come in a reusable clear storage box, making cleanup after play fast and convenient. Putting all the pieces back in the box is part of your children's play, so you never have to clean up after them. You’ll be glad to know that our building blocks are 100% Phthalate, Lead and BPA-free. They are also non-toxic and easy to wash to keep germs away. We manufacture our products using only child-friendly materials and regularly conduct rigorous lab tests to make sure your kids are 100% safe from harmful chemicals. Your kid's safety is our #1 priority! MORE PIECES THAN OTHER SIMILAR SETS, UP TO 4 PLAYERS CAN PLAY AT THE SAME TIME - We give you MORE tools, MORE blocks, and MORE plates than other similar sets. Because we're so confident you'll love our STEM Construction Engineering Building Blocks, it's backed by our IRONCLAD, NO-RISK, 100% MONEY BACK GUARANTEE. If you don't love it for any reason, we'll refund 100% of your purchase price. 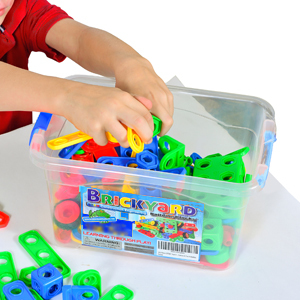 HASSLE-FREE ENJOYMENT GUARANTEED - Brickyard Building Blocks® STEM Construction Engineering Kits are easy to wash and come with a sturdy storage box for quick and convenient cleanups. Each of the 101 bright, colorful, non-toxic pieces are certified Phthalate, Lead, Cadmium, and BPA-free. We invested in child-friendly materials and rigorous lab tests to make sure your kids are 100% safe from harmful chemicals.